Sometimes we have the authority, resources, mandate, or duty to make a difference to others’ lives, or neighbourhoods, or workplaces, or businesses, or environments. Often people want betterment, but lack the means themselves to make their lives more hopeful, safer, more certain, or autonomous. Maybe we’re aiming to tackle litter at the local shops, or prepare a town for floods, or help an agricultural system adapt to climate change, or tackle family violence or ice addiction in a community. In that case we need to design an intervention. Probably the two most important qualities we need to call upon now are caution and curiosity. Recent history is full of catastrophic interventions that left wreckage in their wake, or achieved some goals but at great cost to the social fabric. Usually they lacked both caution and curiosity. Think: the 2003 invasion of Iraq, the 2007 Northern Territory Intervention, and the 2009 Home Insulation (“Pink Batts”) Program. Caution and curiosity, however, have costs: they slow us down. They make us spend time engaging with communities. They force us to start small and learn as we go. We may lose those glorious opportunities for bravura, dash, and heroic poses that politicians and CEOs love. So, when designing an intervention, a critical first question is: how much caution and curiosity is appropriate? What qualities, indeed, should characterise the overall approach? Dave Snowden is a systems thinker who champions a tool he calls Cynefin. It’s a simple 4-sector matrix that identifies four different classes of intervention design, depending on the complexity and turbulence of the situation. I’ve long needed such a tool for my Changeology training, so I thought I’d adapt it, by combining it with another tool called The Public Participation Matrix. Here’s the result. I’ll be testing it out in my next round of public workshops in October. I hope you find it useful. This is just version 1.0, so feedback is very welcome. 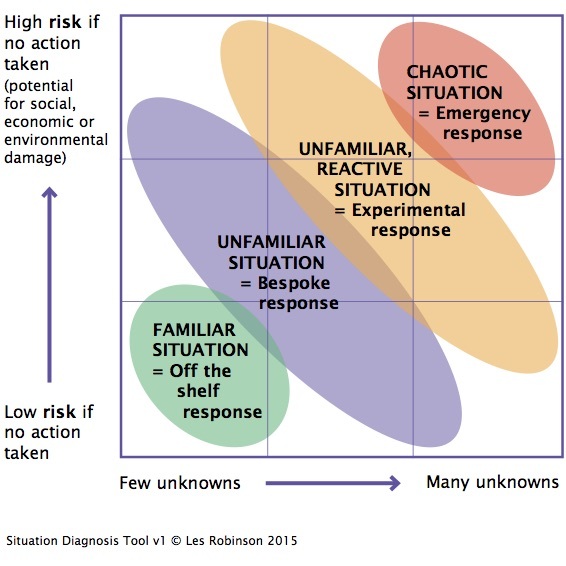 How to use it: Do some initial on-the-ground listening, then make a best guess about the scale of “risk” and “unknowns” inherent in the situation you wish to intervene in. This locates you in one of four classes, each with a different style of intervention. Which class does your problem fall into? The idea is to be very clear about which class you are in before you start. A mismatch between classes and situations practically guarantees the failure of your efforts (at the very least). It will be immediately obvious, for example, that the 2003 Iraq invasion, the Northern Territory Intervention, and the Home Insulation (“Pink Batts”) Program mismatched their situations and responses. Calm. Actors well known, not likely to resist strongly. You are aware of models that have worked successfully in similar situations. Apply best practice or business as usual. Cut and paste successful ideas from comparable situations. Apply basic user engagement (for example, focus groups to pre-test ideas). Unfamiliar, with significant unknowns. The actors are numerous and diverse, and some may resist strongly. Unclear which of several possible solutions is appropriate. “Somewhat wicked”. Mobilise a multi-disciplinary “brains trust” that includes users; craft a customised solution by mixing and matching from a wide palette of possibilities. Strategies should be multi-dimensional, working in more than one domain and mobilise more than one kind of expertise (e.g. mixing infrastructure, service design, communication, skill-building, leadership), and able to rapidly adapt (because some reactions will be unpredictable). Proceed by pilots, and gradually scale up. User engagement via social research and “consult/involve” level community engagement (for example, via an advisory workshop). Unfamiliar and “stormy”. Dominated by unknowns, highly charged, rapidly changing, or politicised. High potential for strong resistance. Actors are numerous, diverse, sensitive, with likelihood of strong, unpredictable responses. Unclear if any existing solution is appropriate. “Very wicked”. Probe the problem with a range of modest experimental projects, selecting a sub-set of solutions to prototype and develop further. Again, be prepared to work in more than one domain and mobilise more than one kind of expertise (e.g. mixing infrastructure, service design, communication, skill-building, leadership). User engagement via social research, multi-disciplinary “Brains Trust” including users, and community engagement at the “Collaborate” level (e.g. program developed and delivered in partnership with trusted local organisations, and outsourcing to the affected community). Australia’s effective response to the HIV epidemic is a good example of this class of intervention. Natural or human disaster requiring urgent action; highly charged; politicised. Actors are numerous, diverse, reactive, with likelihood of strong, unpredictable responses. There are a range of possible solutions but there’s no way to tell, from a distance, which might make the situation better and which might make it worse. Attack the problem with urgency but enable local improvisation with high tolerance for imperfection. Invest heavily in intelligence and communications, with tight feedback loops. Train and support agile, well-equipped, local agents and actors. User engagement at the “empower” level (e.g. outsource local responses to autonomous local actors – Community Fire Guard is an example). Disaster response, bushfire management, and military action are examples of this class of intervention. * From the Wikipedia entry: Cynefin. Previous Previous post: How normal is recycling? AMAZINGLY normal. Interesting post thanks Les but some more well know and worked through examples would really help this I think. In particular I was intrigued by where you think your three examples…Iraq invasion, pink batts and NT intervention sit in your diagram (as in where the mismatch was)…or perhaps there are some easier examples. I think the answer is: all three examples were incurious about the complexity and reactivity of the social environments they were entering into, and chose styles of intervention (cumbersome, massive, one-off roll-outs) that lacked agility or the possibility of local variation, not only failing to consult locals, but failing even to make use of the multi-disciplinary expertise that was available if they’d invited it into the design process. The 2003 Iraq Invasion was a business-as-usual project of the Pentagon utterly unprepared for the reactions of Iraqi society, starkly demonstrated by the sacking of the Baghdad archaeological museum by criminal gangs and individuals almost immediately after the capture of the city. The 2007 NT Intervention was sketched on the back of an envelope by (ex military officer) Mal Brough and John Howard and involved essentially a military invasion of NT communities and the stripping of local autonomy: no account was taken of how indigenous people would react to those measures. It is still completely unclear – despite disputed claims both ways – whether the sum result is negative or positive, largely I believe because indigenous people are now so thoroughly alienated they refuse to cooperate with evaluators. The Pink Batts Program was prepared by young, well-meaning, inexperienced staff in the Department of the Environment (I saw them at work). They were ambushed by the surprising number of cowboy operators out there, something they would have become aware off if they had used more seasoned industry expertise. – “emergency programs” which enable and empower local agents and actors to respond as they see fit. Thanks for asking Mel; it’s helped me be clearer about the ideas, and I’ve edited the post as a result. Les, interesting framework here. I found it as I prepare to travel next week to a post-conflict, West African country to do a couple of presentations on regulatory and institutional reform in a sector that has been plagued with corruption, mismanagement and poor governance for decades and which has suffered in the last decade from the well-intentioned efforts of ODA “innocents abroad” magic bullet solutions and tremendous political/economic pressure from multi-nationals and their local beneficiaries to continue with the status quo. In that context, the response domain is the “Chaotic” one. The biggest problem lies in getting acceptance that this is where things are. For the international development community (which provides the bulk of the financing available for reform), they are strongly vested in seeing situations as “familiar” or “unfamiliar”, with allowance for a bit of “reactive”. This is due to the nature and political economy of their financing and ODA in general. I am considering if I may find a way to introduce your framework into the working group discussions to try and get the local stakeholders to analyze where they are and push back on the ODA actors. Hi Liam… Thanks for your comments. I’d be very interested in what you learn from using this tool: I’d love to find ways to tweek it. God luck with your mission!